Indeed the Beatles were successful in putting words to the feelings that one gets in fascinating Rishikesh. The emerald green water, the equally green hills and the shimmering white sand. I thought only Goa could spur such magic but I was completely wrong. Rishikesh is essentially the first place that the sacred Ganges River exits the mountains and enters the plains of India. In the high mountains, the water travels through forests and remains in clear glory. At this part of the river, nothing of the slush to come is visible. The Ganges’ poor reputation is well deserved once it reaches Varanasi, where riverside cremations and funeral pyres create a thick, polluted river that flows into the rest of the country. As an avid India traveler who has covered 16 states in about 3 years of travel (spread over 12 years), I am often asked, “Where is your favorite place?” I always find it tough to answer as I have a LOT of favorite places. Usually, my answer will depend on my mood. 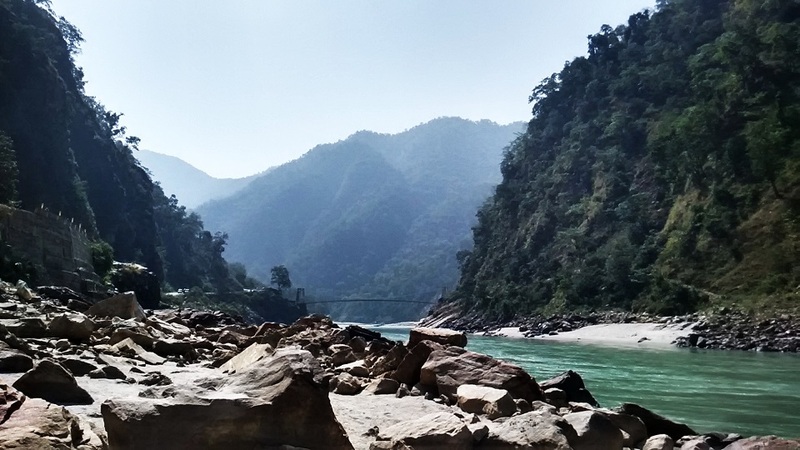 With this blog, I am answering the question one favourite place at a time — starting with a small town in north India called “Rishikesh” I find Rishikesh a deceptively powerful place. Its robust, pristine nature, and the fact that it is probably the most easily accessible place in the Himalayas, from the capital city of New Delhi, makes it a fairly beatable tourist destination in the entire Himalayas. A 6-hour journey in a public bus and you find yourself being rejuvenated by the incense wafts on one its many Ganga ghats. The vibe here is both relaxed and reverent. Temple bells ring incessantly, giving almost a musical healing therapy to your ears. The ubiquitous, charming company of yogis, and the never-dying incense wafts in its breeze is nonetheless, always a plus. There is a feeling in Rishikesh unlike anywhere else. The vibe is both relaxed and reverent — and consequently attracts genuine Hindu devotees and gurus as well as western hippies and spiritual dilettantes. While some may ascribe the increasing popularity of Rishikesh to the booming worldwide interest in yoga, in fact people have been gathering at this confluence of nature since the dawn of time to pray, meditate, chant and imbue the peaceful valley with eons of sacred energy. It’s a deceptively powerful place. My favourite spot in Rishiskesh is at the quiet north end, where the sea-green river spills out of the mountains. White sand beaches line the banks, an occasional cow wanders by, and locals, yoga students and hippies gather in small groups to bathe in the chilly, fresh water of India’s most sacred river. Just below is the first of two great pedestrian bridges that span the mighty river. Lakshman Jhula is the smaller bridge, but still it teems with foot traffic, scooters and monkeys. Cafes on both sides overlook the river and one of the most scenic spots in town. From here, Rishikesh wends its way along both banks of the river, at the bottom of a narrow valley. The east side is almost free of car traffic, and a walk from end to end takes about an hour, and passes sadhu huts, parks, and scores of small shops and stalls selling cotton clothes, gems, spiritual souvenirs, Hindu religious icons and snacks. By the time you get to the other bridge, the big one, Ram Jhula, you are in the thick of the busiest part of Rishikesh. Sprawling ashrams, bustling restaurants, busy temples and statues depicting scenes from Hindu epics and the Bhagavad Gita abound. *According to Lonely Planet, Rishikesh is one of the most famous destination for international tourism planning a trip to India. Travel to this town and you’ll feel it’s high energy! Rishikesh is divided into two main areas: the crowded and very lively Rishikesh town, where the local bus and train stations are situated and also the popular Triveni Ghat (a popular travel destination, an auspicious bathing ghat and place of prayer on the Ganges), and the riverside communities that are 2 km upstream around Ram Jhula and Lakshman Jhula, where most of the accommodation, ashrams, restaurants and travelers are ensconced. 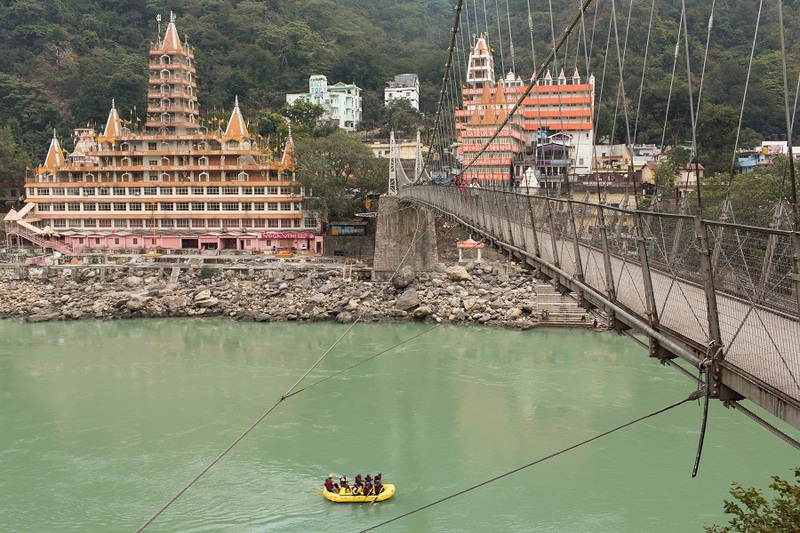 Swarg Ashram, located on the eastern bank, is the traffic-free ‘spiritual center’ of Rishikesh, while High Bank, west of Lakshman Jhula, is a small enclave popular with backpackers. It is at this end, near the huge Parmath Niketan ashram, where the nightly aarti(spiritual ritual) takes place at dusk on the ghats (steps), in front of a massive white statute of Shiva in meditation pose. It is an exciting event to take part in: pandits chant and wave oil lamps as the sun sets, and after dark everyone is invited to release small offerings — little “boats” made of flowers and leaves, containing a candle and incense stick — on the strong currents of the black river. Rishikesh has something to offer for everyone – from those looking for a month-long yoga vacation to the less fortunate, time bounded, adventure seekers. Well, there’s a feeling in Rishikesh unlike anywhere else, and it draws you in. So, Here is How I spent my 5 days in the Yoga Capital of the World ? With excitement, curiosity and a fascination for all things beautiful, I embarked on a six hour trip from Delhi to Rishikesh. My aim was to explore the place at my own pace without rushing into things. I had planned this trip on a shoestring budget and hence did not want to spend a bomb on accommodation. A friend from Delhi had told me about a recently opened hostel there called Zostel. As soon I reached Rishikesh bus stop I started exploring the lanes of rishikesh, getting the spiritual vibes of holy river Ganga flowing by and moved towards tapovan where the hostel is located. On reaching Tapovan I called up the number available on the website and was guided to the hostel. It is located at a convenient place, quite close to the Laxman jhula. It is a cosy, beautiful property, ideal for budget travelers. I was happy to see the concept of backpackers’ hostel and social travel catching up so fast in India. I took a room in their mixed dorm, kept my luggage in one of the lockers and went out to explore the town. After a long journey, I was fairly hungry and wanted to eat at one of the riverside cafes which Rishikesh is quite famous for. The guy at the counter at Zostel told me about a few of them close to the Laxman Jhula. For my very first day in Rishikesh, I happily wandered the town, relaxed in cafe with with river view and caught up on blogging. In evening I attended the Ganga Aarti at Parmeth Niketan Ashram in Rishikesh. This is the largest and best known Ashram in the area – set on the banks of the holy river. It accommodates up to 2,000 people at any one time. The Ganga Aarti were beautiful if somewhat marred by the many visitors who it seemed had come predominantly to take photos as opposed to soak up the atmosphere and appreciate the rituals. My second day at the place deserved to be an adventurous one and so I decided to try my hand at the sport Rishikesh is known for- rafting. Few Travelers I met there had helped me with all the details and I’d managed to find myself a trainer. At 9 in the morning, I found myself at the rafting site staring at the gushing waters and waiting eagerly to meet them. There, I met Tom an expert rafter who would also be my trainer. He told me that we would cover a total distance of 26kms in approximately 4 hours. He taught me some basic signs, which I was supposed to use in case I wanted to communicate with him while rafting. I, along with eight other people, all of them strangers, went on an adventure of a lifetime. As we kept tossing over the white waters, I came into close contact with the power and might of nature that made me revere it even more. During the entire trip we came across several rapids such as Good morning, Three Blind Mice, Crossfire and Club House (as identified by Tom). At many points during the session we felt that our raft would turn upside-down but thanks to Tom’s decisiveness and our meticulous following of instructions, nothing unfortunate happened. Tom was an amazing instructor, a rockstar, but he spoke very little. And I am a curious person , so I pestered him to no extent and after much prodding he gave in. I learned that he was basically from England and had been living in India for three months then. He has rafted around the world, in some challenging spots like Zambezi, where getting down from your raft abruptly meant sure-shot death. And then I realized, he too, like Siddhartha from the book I was reading, has a definite goal in mind, and that goal is to stretch his boundaries to the farthest point. It takes courage to get out of your comfort zone and explore dangerous terrains especially when most of the people around you are totally smug and satisfied in the sheltered life they are leading. The day was physically tiring and my mind was almost saturated with a lot of things. I did not have much energy left to do anything else, so I decided to eat at the Little Buddha Cafe, and it was jam packed with international traveler. This is a pretty, tree-house themed restaurant with a lounge-like vibe – but can get very hot in summers because it is open with no fans or air conditioning. I did manage to get a table, but this place is only worth the wait if you get one of the three / four tables right by the edge of the terrace – overlooking the Ganga. Those are splendid! The food at Little Buddha Cafe was pretty average according to me, but then, it is catered for foreign tourists who travel across the town and are the regulars here. Their menu has a variety of dishes like three cheese Salads, bland (VERY bland) nachos and other non-spicy food items that seemed to be a hit. The vegetable platter is famous. Shakes are good, and the staff is friendly. The service though, is slow. I had a light lunch and then went back to Zostel to rest. Once I woke up, I decided to leave to Hill Top Swiss Cottage which i booked for my stay for my further in this city with the hill top view. I had my dinner and After that, I went to the terrace for an impromptu jamming session with the travelers staying there for more than a month. After two hours of continuous dancing and singing, we all were tired and went back to our respective cottages to sleep. I had yet another day in this beautiful place to look forward to. Ever woke up to the sound of cascading waters? Imagine the chilly breeze kissing your cheeks, you endlessly gazing at trees swaying by with rhythm of chirping birds, tiny splashes of water touching your face now and then and of course the calmly dawning sun. The peace and the connect you feel with your spirit in the moment cannot be described into words here. With the basking sun spanning the horizon and shining on us, the next morning I woke up and spent time in the river playing like kids in the splashing water, snapping some memories and enjoying. It seemed as if the place was awaiting our presence when the weather took a toss and the scorching heat turned away its face and drizzles trickled down. After satisfying our tummies and relaxing for some time, we tucked into our trek suits to make way for a short trek to Neergarh Waterfall. Where first 2 kms were just a simple walk crossing the camps and striding on narrow side paths, next 1.5 kms were steep and little hard but the ultimate destination kept our spirits high. Paving our way through camps, steep cuts and turns, twists and jumps, stepping the stones and climbing the rocks, cutting through the lush emerald green hills, we finally witnessed the elegance of nature. We knew we had made it to our destination when the distant sound of water gushing down the hills became clear with each step forward. The excitement and the satisfaction of reaching the final trek point, NeerGarh Waterfalls, bought a deep smile on our faces. Neer Gaddu Waterfall is around 4 km from Laxman Jhula, and about 6 km from the Rishikesh main market. From the Rishikesh Badrinath Highway, there is small hilly trek to reach Neer Gaddu Waterfall. On the way back to hotel from waterfall Ashish took us to Bhootnath temple *Mahadev temple to be precise that she asserted the most beautiful and peaceful temple nearby and the best thing was you could capture the whole city from here. True!! You could see the whole ways from here, what I found about this temple is that it had become commercial as it was written that move to next floor for this specific god. Quite funny but learned to never mess with God matters so kept silent. The voice of bells was echoing as I touched it. Still, that kid in me to touch the bell and ring it as many of times as I could were alive. On the rooftop, alluring landscape was representing Rishikesh in a picture. and then We went back to the Ramjhula and sat close to a beach. Did crazy stuff like laying on the stone, posing to the camera so comfortable that nobody is watching us. I woke up early to give a treat of fresh breeze to my lungs. I walked down to the ghat to have a closer feel of the morning waft. The wind was blowing at much higher speed than I thought. I saw many orange clad sadhus who had nestled themselves some corners on the open ghat last night were performing their daily chores. Some were taking baths in frosty Ganga water while some were enchanting some mantras and simultaneously cleaning the ghat. I went down on the steps till the water kissed my feet. I parked myself on one of the steps with my feet in water for some time but it was so chill that I had to take them out after few seconds. I spent some time silently adoring the quietude of the surroundings and incessantly travelling river. I looked around for the giant Lord Shiva statue in middle of the river but soon the memories of last year catastrophe which wiped away the certain towns and the statue too grabbed my muse. But I guess people have moved on and the place was returning to its pre-catastrophe charm again. Soon after that I hired a shared cab to Neelkanth Mandir, around 35 Kms from Rishikesh. Neelkanth Mahadev Temple is a Hindu temple dedicated to Neelkanth(Lord Shiva). The temple is situated at a height of 1330 meters. The entire way to the Neelkanth Mahadev Temple was treat to eyes . it took us 2 hour to offer the prayer as it was very crowded. It was getting dark and we were tired so, we decided to go back to our hotel early and take some rest as the last day in Rishikesh was going to be hectic. This day was dedicated to the Beatles. You cannot come to Rishikesh and not visit the Beatles Ashram, especially if you love music. Beatles had visited Rishikesh in 1968 to learn ‘Transcendental Meditation”- which obviously sounds fancy enough to lure them into coming to an obscure place in the Himalayas and settling here for months. After breakfast comprising of milk, fruits and muesli, I went all the way to Maharishi Mahesh Yogi’s Ashram or the Beatles’ Ashram as it is more popularly known, situated at the foothills of Himalayas. And I couldn’t stop myself from humming- doo doo doo doo doo doo! Coming to this place and not humming a Beatles song is sacrilegious. You should never do that else you might end up offending the hippie gods! Ok, I was kidding all right, but this does make a great story- pay homage to Beatles at their Ashram and bless your soul! Not much of the aforementioned Ashram remains except a wall with amazing graffiti, which was the Beatles gallery once. One thing worth noting is that the Ashram closed down way back in the 90s, but usually the guards are sweet enough to let you in. Next I visited the Swarg Ashram, which lies at the ‘ground zero’ of Rishikesh and is known for providing free courses on Yoga and meditation. I decided to do a bit of both. Yoga, as an ancient art form, has many takers all around the world, and this Ashram also was filled with more foreigners than Indians. The entire atmosphere was energetic yet peaceful, something I had not experienced in a long time. After trying my hand at Yoga and chanting a few ‘Oms’ amidst stunning backdrop of rolling mountains, I realized my stomach was rumbling and I needed to grab a bite before doing anything else. On my way to Lakshman Jhula, I discovered an amazing café called Café Beatles. It was great, the food was great and so was the ambience. And the music, well it was the Beatles’. Yes, it was an eventful day, after which I went back to Hill Top Swiss Cottage for yet another evening filled with fun, music and some of the best people I have ever met. It was my last night at Rishikesh, and I had to make it count. We sang, danced and talked till morning, after which I bade them farewell, hoping to meet them sometime soon in future. After all ‘hope is a good thing, maybe the best of things, and no good thing ever dies’. My days in Rishikesh were phenomenal. It was a journey that enriched me from within and made me look at the world with a totally different perspective. I realized there is so much to live for, so much to explore. My problems and worries suddenly turned miniscule in comparison to the wonders of this world. I am still a long way to go before I become a seasoned traveler but the seeds have been sown and the process has begun. I am falling in love with the world and its quirks. May be this is what enticed the Beatles into entering an uncertain world of spirituality. Let me know if you too are into runcationing. Have you been to Rishikesh? Has your experience been any different? I’m all ears!